cb.jpg - Cheeseburger & Fries at Mr.Smith's in Georgetown,KY. chf10.gif - Ch&F in Renfro Valley, April 1997.
chf52.gif - Ch&F in woods outside of Conway, KY.
eggroll.gif - The only known pic of Eggroll & Fries, taken from the Georgetown,KY newspaper The Georgetonian. friesbubble.gif - Spherical psychedelic treatment of a Ch&F pic taken in Georgetown. grillo5.gif - Grillo in medieval helmet, hockey mask, and Giant plastic collar in front of wooden door, December 1996.
grillofridge.gif - Grillo with saucepan on head, beckoning in front of JSH's fridge, August 1997.
grillokun.gif - Superdeformed Baby Grillo hurtles through space. friesfilmlogo.gif - logo graphic for the ever-in-progress Ch&F feature film. 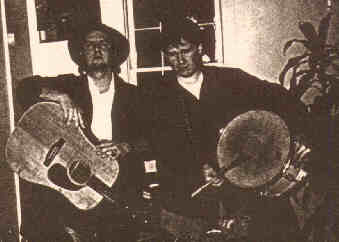 hartman600.gif - The Hartman Band on JSH's front porch in Berea, Spring 1997.
jlk.jpg - drawing of JLK, done by JSH for the cover of the Hartman Band's "Free Stylin' '95" maxi-single. jsh2.gif - JSH at home with one of his robots, Summer 1997.
jsh9.gif - Closeup of JSH taken at WRFL, circa 1995.
jshbanjo1.gif - JSH playing banjo at Shay Quillen's house, Spring 1993.
keepagoin.gif - JSH in the woods near Tater Knob, KY by a sign that reads "Keep a goin'"
rothcover_sm.gif - Cover of the s/t Elizabeth Roth CD.